At Farmers Union Oil Co. of Montevideo, we take pride in having the right people, facilities, and equipment to meet your agronomy needs. With locations in Montevideo and Granite Falls, we are able to help you with the services you need to get your crop planted and taken care of throughout the growing season. We just added a state-of-the-art bulk chemical warehouse that houses 14 different herbicides and liquid fertilizer products. We continue to keep our rolling stock updated so we can help with your custom application needs. 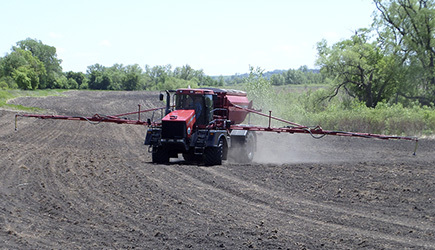 We have seven air flow machines for applying dry fertilizer. One of these machines is a soil tech 4 bin for applying variable rate blends of fertilizer. Four of the other machines can apply a blend with variable rate technology. To tend these machines, we have fourteen tenders and three of these have been recently upgraded with newer models. There has been a greater need for spring applied liquid fertilizer and herbicides, and we are dedicating four sprayers with floatation tires to help keep up with this workload. We have five total sprayers for the summer workload: 3-120’ boom, 1-100’ boom, and a 90’ boom model. 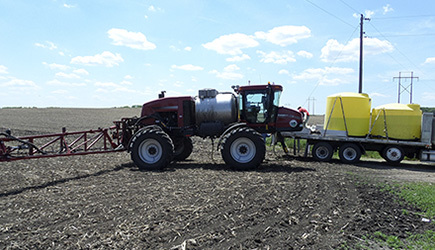 We custom-apply anhydrous ammonia in the fall with four to five machines, and we have also started custom-applying 28% nitrogen as a side-dress application. Don’t forget to soil sample—we have staff to pull soil samples so you can apply the proper amount of fertility too.